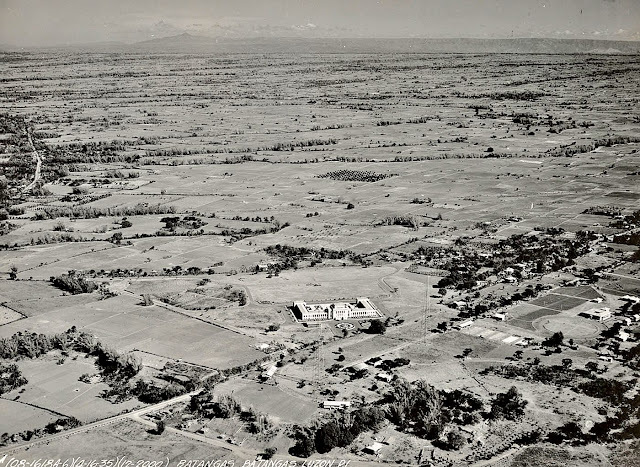 An aerial photograph of the Batangas Provincial Capitol taken in 1935. Image source: United States National Archives. The photograph above was taken in the then-town of Batangas on 31 July 1935 by an airplane that flew from Nichols Airfield, now known as Villamor Airbase in Pasay City. The shot appears to be that of the Provincial Capitol Building. Modern day readers will doubtless be awestruck by the amount of open spaces in the then-town of Batangas in that era, especially in contrast to the present day. The picture was downloaded from the United States National Archives with the original caption “Area 18, Philippine Islands, Luzon Island, Batangas Province, Batangas.” It has been improved compared to the original downloaded picture using graphic software. Below, a colorized version of the top picture courtesy of Algorithmia.